As posted on the MSN News website, May 31, 2012. 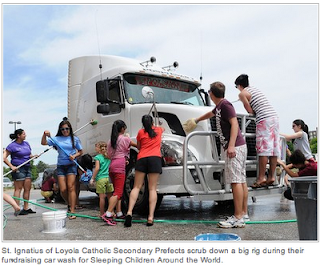 St. Ignatius of Loyola Catholic Secondary Prefects hosted a successful fundraising car wash for Sleeping Children Around the World (SCAW) on Saturday. SCAW is a foundation that provides bedkits to children in underdeveloped countries for each donation of $35. Each bedkit contains a mat or mattress, pillow, sheet, blanket, mosquito net, outfit of clothes, and school supplies. The supplies vary from country to country depending on the specific needs of the region. Loyola school Prefects have raised over $700 for SCAW since first adopting the cause. 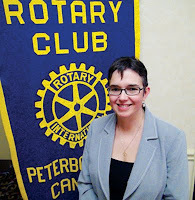 As posted on The Casket, the community newspaper for Antigonish town and county May 29, 2012. What will $35 buy, a morning coffee for three weeks, a small tank of gas, lunch for two? Thirty-five dollars can be the difference between life and death for a child in a developing country. Sleeping Children Around the World (SCAW) is a charity depending solely on word of mouth promotion. Founded in 1970 by Margaret and Murray Dryden, parents to former NHLer Ken, 100 percent of SCAW fundraising goes to those who need it most. With zero overhead, all levels of the organization operate voluntarily or through a trust fund set up by Murray Dryden to offset administrative costs. Clarence DeYoung of Pomquet, who lived in Toronto and Halifax for the last few decades, became involved with SCAW after his daughter came home from school and told him about a talk a man, that being Dryden, gave at her school about helping children. Once he heard Dryden, a charismatic and convincing speaker, DeYoung wanted to help out. Only recently has he stepped back from serving in an executive capacity with the organization, though remains a volunteer advocate for SCAW. There is a possibility he will make a trip this fall to help oversee bed kit distribution, he has travelled to eight different countries on behalf of the organization since 1989. Even those who travel to the countries benefitting from the SCAW pay their own way. Communities in countries like India, Kenya, the Philippines, Sri Lanka, Honduras and Bangladesh have benefitted in the past from the work done both in their own countries through local production of the bed kits and through Canadian volunteers. SCAW is a truly grassroots organization depending on the volunteer commitment and freewill offers from donors. Volunteers can be asked to speak at a function or event about what the organization does and beyond that it comes down to the generosity of those in the audience. An effective tool, given recently $150,000 was raised in Toronto, where DeYoung spoke about his experiences with the SCAW. “We work with partners in communities, in the most recent example with a Rotary Club in Nicaragua. They coordinated everything, with guidelines from us they select the items that go into the bed kit and select the children who are going to receive them,” he said. SCAW volunteers then travel to the country and work with the service club on distribution. Children received a bed kit and have their picture taken with a small sign showing the donor’s name. The team travels to these countries to assure the bed kit is good quality and that the neediest children are getting the bed kits which are often passed on to children within the family or community. “The process is we dress them in clothes from the bed kit, then we take their pictures and from there get their bed kit. If we gave them the bed kit first we could never get them calmed down enough, they are so excited,” he said. DeYoung said it is important to listen to locals about what is needed in a bed kit. It can consist of a pair of shoes, in some cases, depending on the country, sweaters or t-shirts, shorts or pants, an extra blanket, a bed mat, a mattress, school supplies, food containers or items like a water canteen. 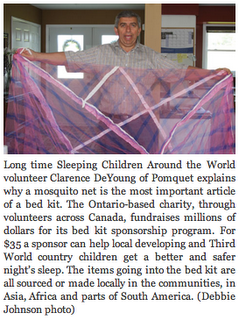 The most crucial item is a mosquito net and with World Health Organization approval a newer model is part of the kit. The fibres are impregnated with an environmentally friendly repellant lasting up to five or four years, killing mosquitoes yet not harming the child underneath it. Along with malaria mosquitoes also carry other diseases like West Nile Virus. Each net costing $4 to $6 dollars and is the most valuable item in the bed kit. “With every distribution we are interviewing the mothers on what is culturally acceptable and what the kids need,” he said, making sure every cent is spent on the children. To qualify the per capita income of the family needs to be less than $2,000 annually, many of the countries are in the $300 to $500 range. That translates to making less than $2 a day to have a child receive a bed kit. The organization has distributed 1.25 million bed kits since the early 1970s. 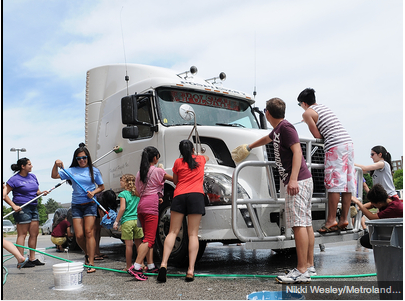 DeYoung said the level of happiness connected to how the $35 is spent is part of what kept him involved. A child gets a mattress that would otherwise be sleeping on a dirt floor and when they show up at the bed kit distribution he said they show up nothing but the clothes on their back. DeYoung shared a number of photos of his travels and though he had become accustomed to seeing the poverty and destitution of the communities one little boy, who was living with polio, haunted him after his return to Canada. “I had seen so many things over the years… but I would wake up in the middle of the night thinking of him,” he said. He in turn, arranged for a series of three operations through connections in Bangladesh. After the operations and therapy, costing $400, the boy was ready to go home. The hospital kept him a little longer so DeYoung could visit with him. As he walked down the hall the boy walked towards him, the operations and therapy a success. He said SCAW works to demonstrate how every dollar is used for the bed kits that are sewn by hand with cottage industries in the communities and surrounding areas. He notes the impact the donations have locally and volunteers also inspect the factories where items like mattresses are made to assure that no child labour is being used. He said a bed kit donation is a gift that keeps on giving in someone’s name, as Christmas or birthday gifts, or posthumously as a gift in memory of a deceased friend or family member. As posted on insideHALTON.com May 26, 2012.